Tropicana Field turned into a Little League funhouse Friday night when Marlins batter JT Realmuto hit a double, only to advance all the way to home plate, scoring a run, thanks to a fortuitous base award and series of errors by Tampa Bay Rays fielders Adeiny Hechavarria and Daniel Robertson, highlighting the importance of timing and rules application when it comes to base awards for balls that fall out of play. Did umpires correctly award bases? 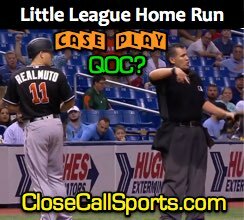 The Play: With one out and one on (R1) in the top of the 7th inning of Friday's Marlins-Rays game, Marlins batter Realmuto hit a fly ball to Rays left fielder Jake Bauers, who fielded the batted ball on a carom off the outfield wall and threw to shortstop Adeiny Hechavarria, who fumbled the throw (Tampa's first error), which bounced into foul ground, spurring third baseman Daniel Robertson to run in and accidentally kick the ball out of play and into the third base dugout (Tampa's second error), resulting in two-base awards for baserunner R1 Brian Anderson and batter-runner Realmuto, which, for both runners, so happened to be home plate. Case Play Question: Was this the correct ruling (BR and R1 to home plate) or should the base award have been less generous (e.g., BR to third base and R1 to home plate, etc.)? Better yet, imagine yourself as the Replay Official and Rays Manager Kevin Cash opted to challenge the runner placement call. What would you do? Accordingly, in the ever-popular "Time of Pitch vs Time of Throw" (TOP vs TOT) base awards debate, it would appear that umpire Jeff Nelson's crew used a third term: TOE, or "Time of Error." Is this a correct application of rules? Answer: There are several trains of thought pertaining to this play, which appears by all accounts to be a throw and two accidental kicks, causing the ball to fall out of play. Naturally, if your judgment holds that F5's kick was intentional, then the matter becomes a "Time of Error" (specifically, F5's error) play, with both runners awarded home, and you can stop the analysis right there. If you believe the fielder accidentally kicked the ball out of play, by strict interpretation of the rule—and interpretation manual—we consider the runners' positions at the time of the throw, and award the batter-runner third base (1B + 2 = 3B). This play illustrates a rules complication. Pitfall: A more common sense principle, however, given the complication of two fielders accidentally kicking a ball out of play, suggests a potential consideration of awarding both runners home plate (pursuant to the omnipresent "elastic clause" of umpiring regarding an issue not specifically mentioned in the rules), simply because this is the "common sense and fair play" thing to do for a rule that doesn't precisely fit in this situation. Neither the original rule nor interpretation manual specifically discusses the issue of a thrown ball that comes to rest (the only consideration is whether or not the ball has remained on the playing field prior to it being kicked/deflected out of play), so there isn't rules support for judging this play based on an impetus-of-the-ball or change of direction/momentum rationale. However, it is similarly not within the spirit of the rules to allow a thrown ball to remain "thrown" indefinitely. By strict interpretation of the rule, say that a batter hits a sharp ground ball to the right fielder, who attempts to throw him out at first base. The throw deflects off the first baseman's glove and protractedly rolls along the infield, possibly being unintentionally kicked a few times while the batter-runner is able to make it all the way around the bases and to home plate as the fielders unsuccessful pursue this unusually slippery ball, with the shortstop unintentionally kicking the ball into foul territory near left field. As the batter-runner rounds third base, the third baseman unintentionally kicks the ball into the dugout, and the ball falls out of play a split second before the batter-runner touches home plate. Since the throw initiated by the right fielder occurred prior to the batter-runner touching first base, and this thrown ball was subsequently kicked out of play, strict interpretation of 5.06(b)(4) and the manual would hold that the batter-runner is to be awarded two bases from the time of the throw, or second base (HP + 2 = 2B), even though he has already scored. > "All other deliveries of the ball by one player to another are thrown balls." The batter is short of 2B upon F6's error. Thus, when a ball is no longer being delivered by one player to another, it can no longer be considered a thrown ball (naturally, it remains a "live ball"). The problem, then, is MLBUM/PBUC's interpretation that states, "If a thrown ball goes through or by a fielder and remains on the playing field and is subsequently kicked or deflected out of play (unintentionally in either case), the award is two bases from the time of the throw." Whether or not the ball is "thrown" at this point is immaterial: per MLBUM, the thrown ball went through or by a fielder (F6) and was subsequently kicked or deflected out of play, unintentionally, by F5—there's no time limit, and there's no player limit—the accidental deflection out of play occurred subsequently to the thrown ball that went by a fielder and remained on the playing field. Per the manual, that's two bases from the time of the throw. Gil's Call: This extreme example of a batter-runner who has already scored being sent back to second base illustrates that, surprise surprise, there's a problem with the rule regarding this situation. The rule doesn't say anything about resetting the so-called "Time of X" timer depending on who touches the ball and when—we just know if the kick was intentional, it's two bases from the time of the kick, and if it was unintentional, the rule wants two bases from the time of the throw, which makes less and less sense the longer the thrown/kicked ball remains alive and on the playing field as the runners continue to advance. The tag-up rule operates on a similar principle. Imagine a runner on third base having to wait to tag up on a fly ball until the outfielder catches the batted ball by firmly securing it in his glove—the fielder could easily bobble the ball all the way back to the infield and hold the runner at third (or even double-up the runner for "leaving early"). Thank goodness the powers-that-be put the fielder's first touch into the tagging-up rule—and that rules change was a fairly recent development, too! SIDEBAR: The retouch rule is another part of OBR that is, shall we say, conflicting, as the Definition of Terms correctly refers to "the instant the first fielder touches the ball," while Rule 5.09(b) states, "legally caught." Related Post: Clearing Up a Myth - Timely Retouch of a Bobbled Fly (4/27/17). For this reason, the proper call for this Case Play, in my estimation, is to refer to Rule 8.01(c): "Each umpire has authority to rule on any point not specifically covered in these rules." And because this is an 8.01(c) call, there are two possible solutions to this Case Play: Either award BR third and score R1, or score both runners. This is what Nelson's crew appeared to have done, and whether because of the crew's decisiveness in awarding bases or Tampa Bay's ignorance, manager Kevin Cash declined to challenge, much less argue the issue of runner placement. As long as you can explain the rule—including an affinity to understand its shortcomings and being able to apply 8.01(c)—the book will support either decision. The only conclusively incorrect call here would be to hold BR at second and/or prevent R1 from scoring, since two bases are required, the only question being, "from when?" OBR 5.06(b)(4): "Each runner including the batter-runner may, without liability to be put out, advance—Two bases when, with no spectators on the playing field, a thrown ball goes into the stands, or into a bench...When such wild throw is the first play by an infielder, the umpire, in awarding such bases, shall be governed by the position of the runners at the time the ball was pitched; in all other cases the umpire shall be governed by the position of the runners at the time the wild throw was made." 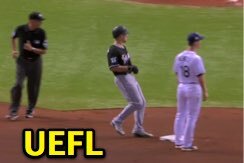 MLBUM (and PBUC): "If a thrown ball deflects off a fielder and goes directly out of play, the award is two bases" [from TOP or TOT, as applicable]. MLBUM (and PBUC): "If a thrown ball goes through or by a fielder and remains on the playing field and is subsequently kicked or deflected out of play (unintentionally in either case), the award is two bases from the time of the throw." MLBUM (and PBUC): "If a fielder has complete possession of a batted or thrown ball and subsequently deflects or kicks the ball out of play, the award is two bases from the position of the runners at the time the ball was kicked or deflected." MLBUM (and PBUC): "If, in the judgment of the umpires, a fielder intentionally kicks or deflects a batted or thrown ball out of play, the award is two bases from the time the ball was kicked or deflected." Related Post: Case Play 2017-9 - The Deflected Error Triple [Solved] (9/14/17).